FILE - Among elephant herds, the matriarchs – older and experienced – provide leadership. What makes a good leader? A team of psychologists, mathematicians, anthropologists and biologists came together over the past two years to find an answer to this question – by looking at animals. The researchers first had to define leadership. They determined that a leader is an individual that, through action, prompts others to follow a certain set of rules. So they influence other individuals within a society. Researchers studied leadership in several mammalian and human societies. They looked at elephant herds, hyena clans, monkey troops and small-scale human societies. Specifically, they studied hunter-gatherer societies, groups that "are fairly remote and don’t have as many interactions with the broader technology-based societies that many of us are experiencing," said Jennifer Smith, an assistant professor of biology at Mills College in California and a co-author of the group’s report, published last month in the journal Trends in Ecology & Evolution. "… We wanted to understand the origins of cooperation, to look back in time so we can look at how leadership roles may have evolved." Biologist Jennifer Smith, a Mills College assistant professor, has studied animals' leadership skills. 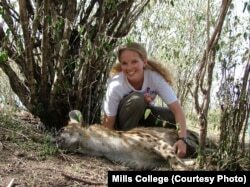 She's shown with a tranquilized spotted hyena in Kenya in an undated photo. Researchers reviewed evidence of leadership across multiple species and within four domains: movement, food acquisition, within-group conflict mediation and between-group interactions or fights. Similarities emerged between human and animal societies in leadership and resource sharing, Smith said. Lions, for example, are among the more equitable species, she said. "They tend to breed cooperatively. Individuals will help each other in rearing offspring. And when it comes to feeding, they also are more equitable in sharing. Even though they have particular leadership roles during hunting, the food is often shared in a broader way. We see similarities to that in human societies." But researchers also found differences, when compared to other mammalian species. "If you look at a chimpanzee or a hyena in the way they dictate power, a leader might be socially dominant and control all of the resources, whereas in human societies oftentimes it’s more equitable," she pointed out. "There are more sharing of the benefits that leaders might help to obtain." Experience was a common trait of most successful leaders. "It’s not how charismatic you are or who your mom was, necessarily. Things like that are less important than the amount of experience individuals have on the ground," Smith reported, pointing to elephants as an example. "We noticed that older matriarchs in the societies – females that have been in these groups for many years, that are very long lived and have this knowledge – are the ones that are calling the shots." The researchers did find some exceptions where rank was inherited. Among spotted hyenas, individuals basically inherit ranks right below their mothers, Smith said. "In those societies, the distribution of resources seems to be less equitable." After looking closely at these species, researchers said humans could learn a thing or two from the interactions of elephants and other mammals. The naïve creatures "don’t necessarily know to negotiate or navigate through their worlds, but through the leadership of the more experienced individuals, they can [learn] new insights," Smith said. "They can benefit from the leadership and experience that these knowledgeable elephants and other kinds of animals have. "What we found here is that, time and again, the most successful leaders are actually those that take all of the demands from the society into account," she added. "And the most equitable leaders that have experience are those that are providing the most benefits to their groups." A leader knows the way, goes the way and shows the way, it is said. The validity of that idea, Smith and her fellow researchers say, is on display in many parts of the animal world. Successful, experienced leaders can pave the way for a successful society. Perhaps that can help reinforce the importance of experience in a world that seems to be constantly looking for the next new thing.